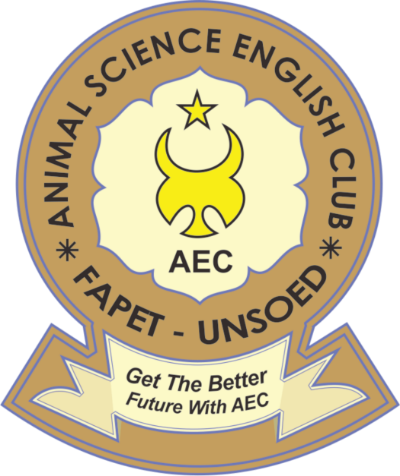 Animal Science English Club (AEC) is one of student activity unit in Animal Science Faculty of Jenderal Soedirman University which established on August 9th, 2003. AEC has a main purpose to socialize English for all student in Animal Science Faculty. AEC has a vision to create English atmosphere around of Animal Science Faculty, and then AEC’s mission are to improve an English ability for students of Animal Science Faculty and facilitate students to developing their English ability. Now days, AEC is advisored by Mr. Novie Andri Setianto, S.Pt, M.Sc, Ph.D, and led by Ahmad Fajrun Najah from branch 2015 and also organized by 23 organizers. AEC which has motto “Together as One” trying to reach feel of togetherness in every organizers and members. English class is agenda which conducted to study about writing, listening and speaking by make some practice and conversation in English. Movieducation is one agenda which conducted with watching a movie for know about moral value, this agenda has purpose to learning English with fun method. Word to Word is agenda which contain about translating international journal (especially international Journal of Livestock). EDD Goes to Society is event which conducted to share knowledge with the society, especially English material. This event combined with AEC Care. Talent Class is a forum which learning and training about English practice or competition for example debating. In order to make more focus in debate, we make community which named English Debate Community (EDC). 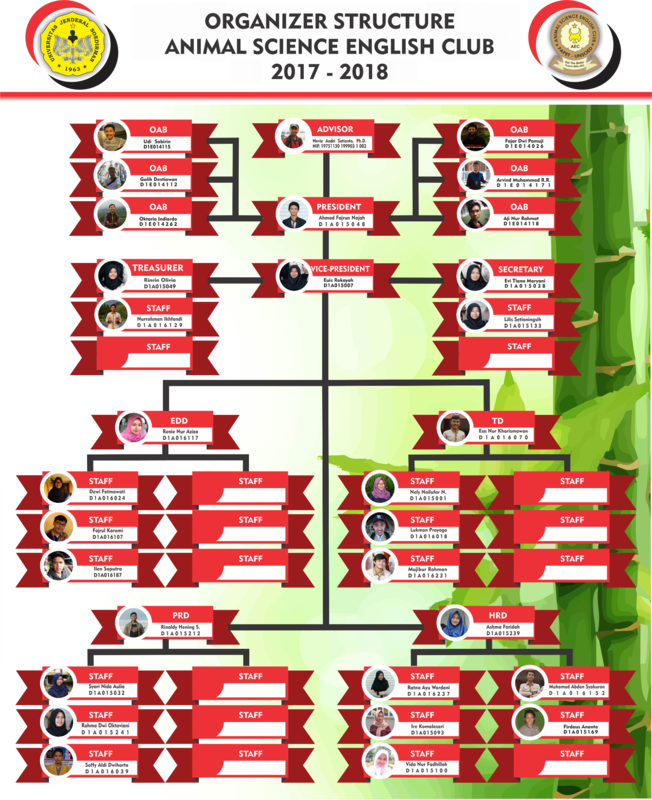 The annual debate competition that always facilitated by Talent Department, there are NUDC (National University Debating Championship) and IFDC (Inter Faculty Debating Championship). This department will keep the student who capable in debate and want to join that competition. Every payment for debate competition will be facilitated from Faculty. ECA is competition event like singing, storytelling, speech, presentation and debating which conducted to celebrate AEC’s anniversary. The last year (2017), AEC have conducted ECA for SMA/SMK/MA around BARLINGMASCAKEB. Work visit is an event which conducted to share information with another English Club, especially in Jenderal Soedirman University. Through this event we can know and get some information and new experience from another people in English Club forum. Tourist Hunting is an event to find foreigner and practice directly to have conversation with them. This event usually conducted in historical place for example Borobudur and Prambanan temple. It’s so fun. AEC Care is event which related directly with society and about humanism. For example we give contribution (material and non material) for the society. This event also conducted to celebrate AEC’s Anniversary. AEC Refreshing is agenda to bring close between organizer and member of AEC. It is an enjoy agenda, we can refreshing, sharing and also camping and eating together. TO is agenda to empowering member of AEC about organization’s life and prepare how to become a good organizer. YMR is annual event to recruit new member of AEC. This way, the first gate you as students of Animal Science Faculty can join with us and become the AEC’eans.